Take your design plan to the next level when you shop at a flooring center with an extensive selection of wood look tile in Yuma, AZ. Modern homes need smart solutions that provide you with the look you want and the durability you deserve. The selection of tile options at Flooring America Yuma includes flooring from many of the major manufacturers you know and love. The charm of hardwood flooring is hard to match, but these planks expand and contract when exposed to moisture. While hardwood is an excellent option for dining rooms and dens, it reacts very differently in places like bathrooms and kitchens. When you visit our establishment, start a conversation with one of our design specialists about your ideas for your new home interior. We carry porcelain and ceramic tile that features a top layer designed to replicate the appearance of natural hardwood. Each is crafted by firing of specialized clays, and they are imprinted with a series of patterns that mimic the grains of different species. When you collaborate with a group that takes the time to personalize your design theme, you get an interior that you are sure to love for years to come. Tile is a mainstay when it comes to the kitchens and bathrooms in area homes. In the hands of a capable contractor, tile made from ceramic can be cut into a broad array of patterns and shapes. As a denser type of tile, porcelain makes a better option for covering walls and outdoor spaces. Our wood plank porcelain tile takes every design in a new direction when you consider the durability and resiliency of this product. Panel the walls of your kitchen with tile that matches the character and appeal of wood. Protect the interior of your home from the added moisture you can expect in a bathroom. In the hands of a creative installation specialist, our wood plank ceramic tile can cover more of your floor than you ever thought possible. With a combination of flooring styles, your home can become a destination for family and friends. Our selection of ceramic wood tile and porcelain tile, with installation by qualified professionals, can serve you well for decades. The water resistance of this product depends on proper grouting and sealing, so choose a team that specializes in this type of flooring for greater success. 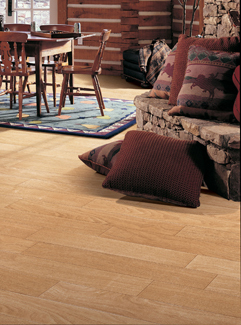 Contact us today to learn more about the durability and charm of wood look tile. We proudly serve customers in Yuma, San Luis, Somerton, Wellton, Dateland, Arizona, and the surrounding communities.